This post is in partnership with World Market and contains affiliate links. As always, all opinions are my own. Click here to read my full disclosure policy. 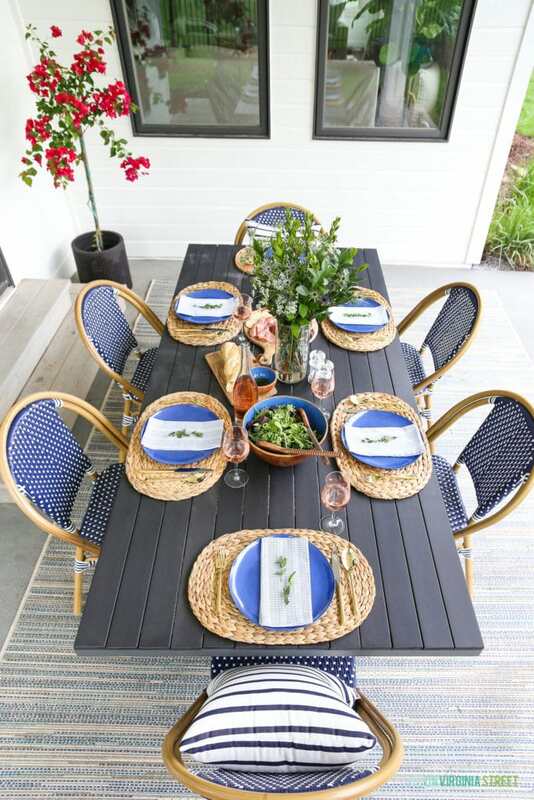 Today I’m going to share tips and tricks for creating your dream outdoor dining space! And lucky for you guys, I noticed World Market has started their Memorial Day sale early. Several of the items are already marked down, but you can also save 15% on your entire purchase online with code STARS15, or 20% if you’re a World Market Explorer Member (free to join) with code FLAGWME. 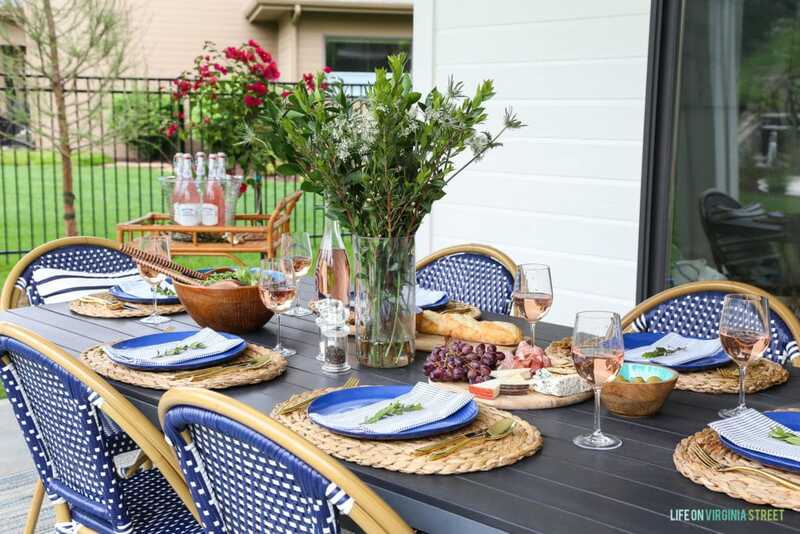 Following are my favorite tips for creating an outdoor dining space you’ll love for years to come! Previously, our dining space was a sea of brown. Brown house, brown windows, brown table, brown chairs. It all just seemed to blend together. It was really hard to get the casual coastal look I was going for when everything was so monotone. Here’s a look at the “before”. 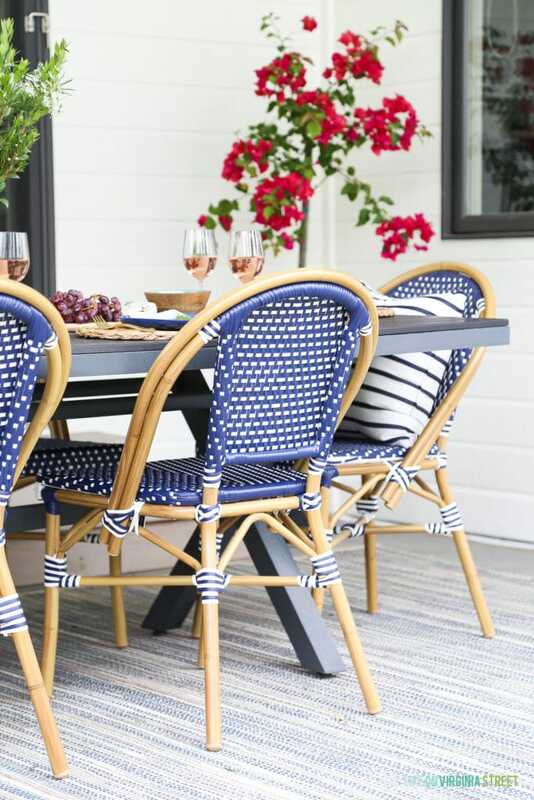 I had been eyeing these navy outdoor bistro chairs for some time and knew they would be the perfect update to the space. Paired with these Sunbrella striped pillows, the space immediately becomes consistent with my interior decorating style! Here is how the space looks now! I couldn’t be more excited about how it turned out! By adding in the pops of blue and white, the space completely changed! 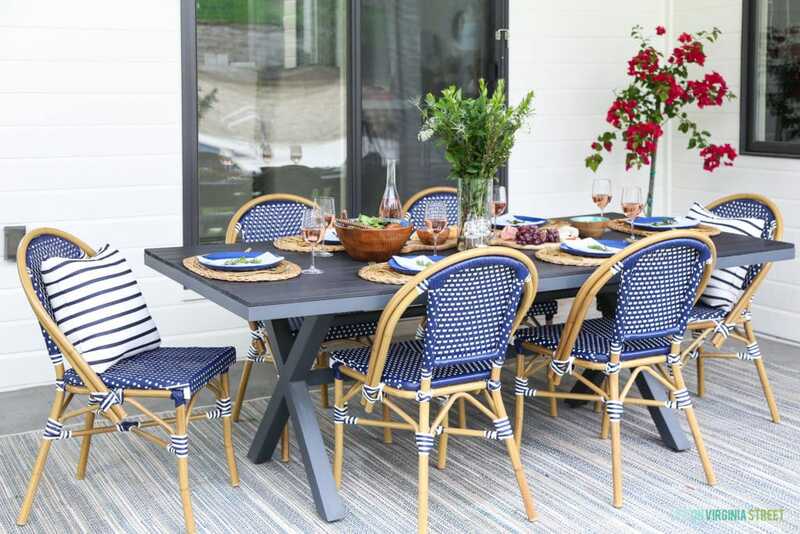 By having key pieces in your favorite decorating color scheme, I think you’ll be amazed at just how easy it is to transform your outdoor dining space! I can’t say enough good things about these chairs. Not only are they too cute to look at, they are comfy, weather-resistant and durable! If blue and white aren’t your think, they also have a black and white version. We’ve had this rug for nearly three years, but World Market has a great selection of outdoor rugs. By using a rug, you ground the space and help define the area – especially if you have other outdoor furniture on your patio. Outdoor rugs are also a fun way to pull in some additional color and pattern! By adding in some clippings from your yard or the grocery store to your tablescape, you instantly add appeal to your table. This could also be achieved by adding flower pots around your dining space, and even adding clippings to your place settings like I did below. I also brought in some bougainvillea to add a punch of color. I love how beautiful the petals pair with the rich blue accents! Having your drinks in a central location off the main table will help free up tabletop space. 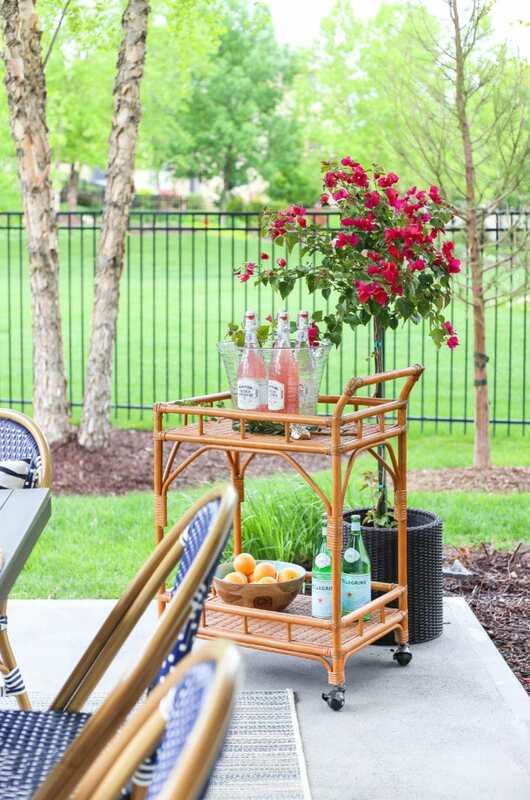 My friend gave me this old barcart some time ago, and I thought it was perfect for the outdoors. While a barcart isn’t necessary, having an ice bucket like this acrylic textured party tub is a necessity! I was surprised at just how much it holds (basically the equivalent of five bottles of wine)! I love that World Market also carries unique drink and food options that work so well for parties! These artisanal lemonade French soda and artisanal cherry and lemon French soda are a delicious (and beautiful!) alternative to your basic cans of soda. And you know I had to buy this gold pineapple bottle opener – the perfect final addition to the drink station! We have a fairly strict no-glass policy in our backyard for safety around out pool. But, I’m guessing most people prefer to avoid glass outside as well. That’s why I’ve always been a fan of World Market’s melamine plates. Their styles look like ceramic or stoneware but you don’t have to worry about them breaking! And I feel like they are a better alternative to paper because you can re-use them and they don’t blow around every time the breeze picks up (which is non-stop in Nebraska. These Indigo Melamine Dinner plates ore so beautiful in real life! Above all else, remember that simplicity is key! 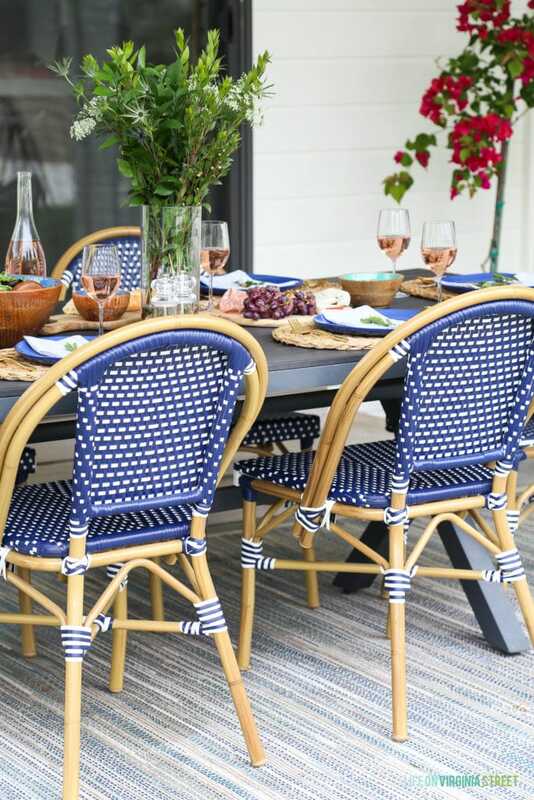 Don’t “overdecorate” your outdoor dining space or feel like every detail has to be perfect. 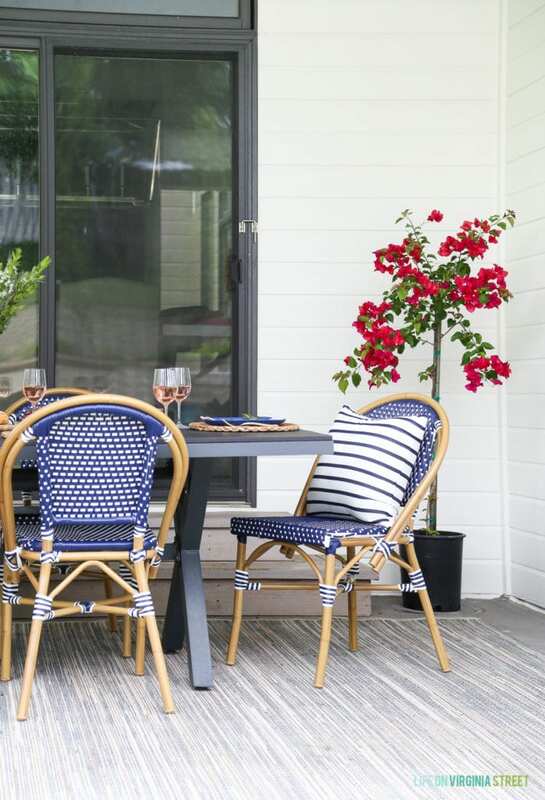 Outdoor dining is intended to be casual and fun and the more you can enjoy yourself, the more guests will enjoy themselves as well! 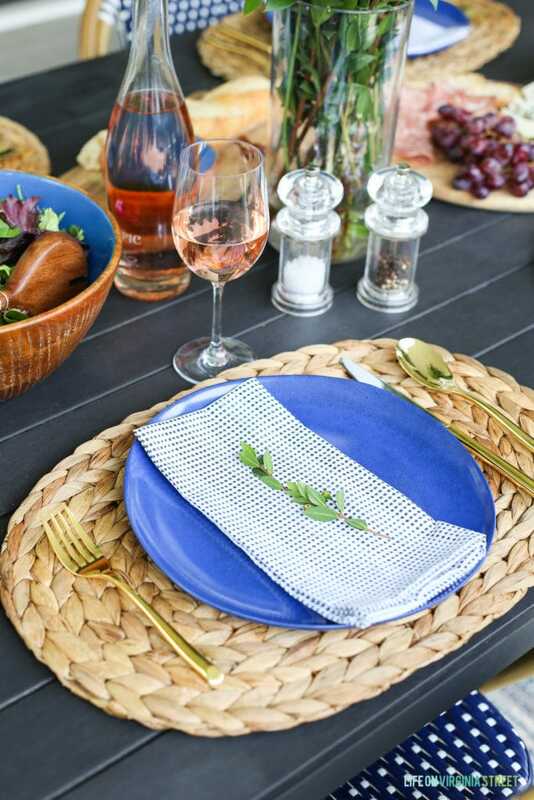 I hope you enjoyed these outdoor dining tips! You can find all of my sources for this space below. 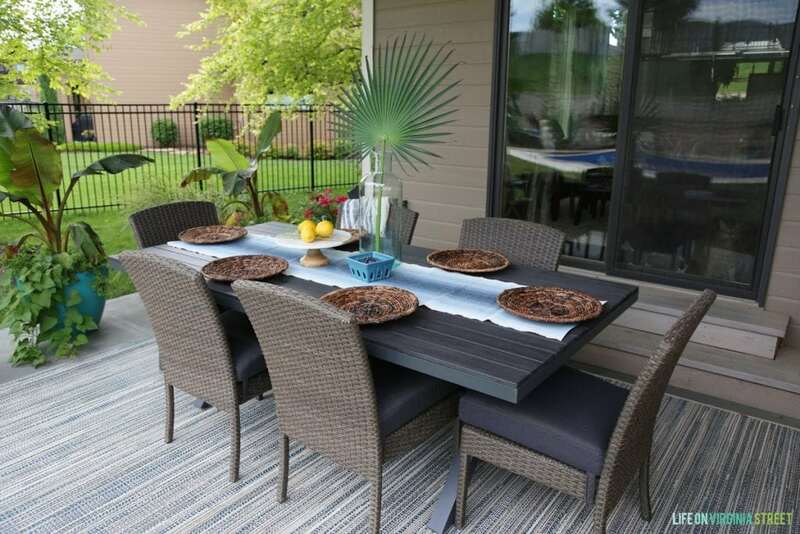 Be sure to also check out all of the other gorgeous outdoor dining options that World Market has to offer! 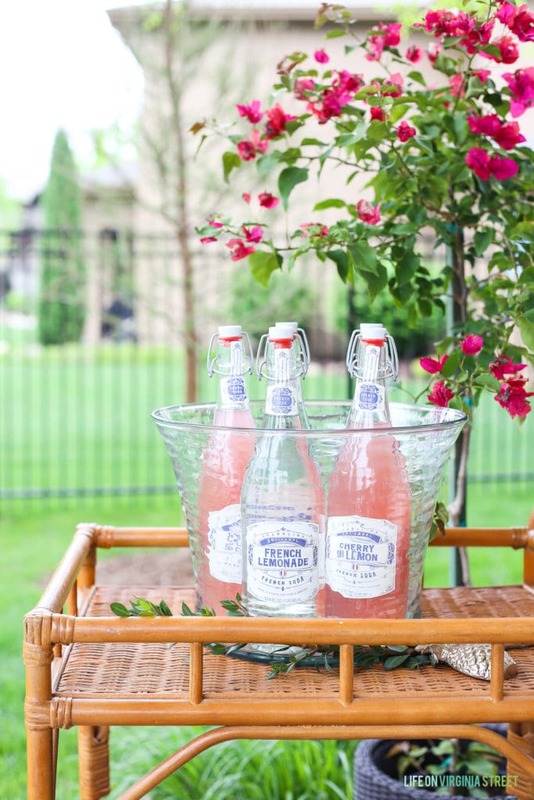 Thank you again to World Market for partnering with me on today’s post! Love the look! What is the name of the pink/red mini-trees on your porch? They are stunning! I love these tips and how you broke everything down so simply! Thank you! Is that a real or faux bougainvillea in the corner? We had a real one and it was very hard to keep “happy” and flowering. Such a fun update! I LOVE World Market so much. They have the best stuff. Thanks for sharing! Love, love the new white!!! Excited to see the whole house in white! Wow Sarah! loved this article. I like the point of simplicity because I also believe that simple looks rich and it never gets out of trend. Thanks for sharing this one. How do you like your wayfair rug? Online the colors look very bright but your outdoor photos look more muted. I could use some addded outdoor color but don’t want it to stick out. Online pics are mixed as well. We love it and it has held up well for nearly three years so far! If you get close up, the blues look brighter, but from a bit further away, it all just kind of blurs together and looks more muted. Overall it has a neutral effect but with a bit of color. Hopefully that makes sense!